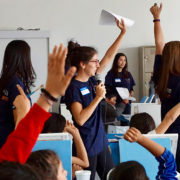 Hola, hello, my name is Teresita I am and artist and educator, and the first of many contributors to the Walls that Unite blog. I’m not much of a writer and this is my first attempt at a blog post, but I am really passionate about my work and I want to share with you’ all the history and my personal experiences with Walls that Unite. 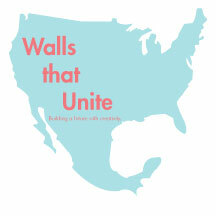 Walls that Unite is a non-profit organization that provides educational experiences to low-income communities in the United States and Mexico. What the heck does that mean? I’ll explain in a sec, but first I want to give context to the voice behind the words you are reading. My full name is Teresita de la Torre, and I was born in Guadalajara, Jalisco to a very large and hardworking family. My parents wanted a better life for my 6 sibling and I, and they knew that college was not an option for us in Mexico, so we migrated to the U.S. when I was 5 years old. We ended up living in a frontera (border town) of Laredo, Texas. I am the second to the youngest in my family and my parent really wanted my sole focus to be school and go to college. They told me since I was very young, “ Nosotros nos hemos partido el lomo toda la vida para que usted no tengan que” – which means “we’ve done backbreaking work all our lives so that you don’t have to.” And they have… my parents have worked as migrant farm worker, worked in sweatshops, washed dishes for a living, and have even crossed the border without documents—all for their children. I’ve really took my parents sacrifices to heart and tried to make them proud by completing a Bachelor’s in Fine Arts from Texas A&M International University, and a Masters in Fine Arts from Cal State Fullerton. I was the first person in my family to begin a Master’s program, and my parents are very proud of my accomplishments.